Remember last year when we did the signed edition thing in the Crusie Book Store? Mollie just put the last of the signed Harlequin and SMP hardcovers in there (that’s a drop down menu on the page, there are more than just Strange Bedpersons). Mollie is usually pretty swift on the shipping (ask those who bought last year), but it’s the Christmas shopping season and evidently everybody is ordering online which means the shipping services are swamped, so be warned. There are also signed paperbacks, so feel free to browse around. Audio sold out fast, so thank you!.but there are a few cassette sets left and they’re free with any order, if anybody still has a cassette player.. We’re giving half of the profits to Planned Parenthood and the ACLU again; last year that was over $2000, but the shop is pretty bare at this point, so it won’t be nearly that this year. And unless I clean out the garage and find more copies (not impossible) this’ll be it for hardcovers until I finish Nita and that comes out. In other words, do not hold your breath. ETA: Mollie says we’re almost out of the large print books for five bucks, only one or two left of every title except Strange Bedpersons (five of those). The covers on those are always ugly, but the words are the same. Just bigger. Thank you! And apologizing again for exploiting you (g). I shopped, and I feel strangely unexploited. Just pleased as punch. Merry Christmas to me!! Thank you. I cycle through my audiobook collection pretty regularly and I can’t wait to add to it. Just wanted to check before placing an order though – are you shipping internationally??? I saw the blog entry just at the end of my lunch hour and didn’t stop to comment. Just rushed right to the store and scooped up all four of the Harlequin hardcovers. Bwah-ha-ha and a Merry Christmas to me! Thank you all. Mollie’s stamping packages as we speak. I am absolutely blissed out to be able to replace my worn out paperbacks of Getting Rid of Bradley and Strange Bedpersons with hardcovers (much easier on my crappy eyes, too) as well as getting the Christmas book. After a day spent looking at an ultrasound of larger-than-six-weeks-ago cystic tumors on my beloved cat Magic’s spleen (my vet called her a “ticking time bomb,” which I’m pretty sure was a reference to the fact that the tumors could kill her any minute, and not Magic’s personality), and dealing with the trials and tribulations of running an artists’ cooperative shop in December, I DESERVE these books. Exploit away, Jenny. You made an otherwise crappy day a little bit brighter. Love and light to you and Magic. Deborah, you and Magic deserve a much better Christmas than this. It won’t be any comfort but my cats who had cancer never seem to realize it until the very end. My poor Moshe would just look at me as his illness progressed and gave me the “What the !!! When did these steps get so high? !” and trudge on up. And the day before he died, he picked a fight with the neighbor’s cat and tried to see if I would let him sit in the street (No he knew better than that, he just liked to push his boundaries). Magic is the luckiest damn cat alive, and he knows it. I hope he makes through Christmas; it’s hard enough without that. You’re in my thoughts, Deb, and so is Magic. Thanks, all. I love all my cats, including her brother Mystic, who is also dying of a slower moving cancer (down to 11 lbs from 16.7), but Magic is a part of my soul. She and Mystic are both 15 (16 in mid-January) and I brought them (along their mom, who I lost last year) home as kittens. She has been sleeping on my pillow and sitting on my lap at breakfast ever since, and supervising everything I do, including the writing. I’m not sure how I’ll sleep or eat or write without her. On the bright side, she doesn’t seem at all uncomfortable (unlike her brother, who is on insanely expensive narcotic pain killers) or realize she is sick. Three years ago I had 5 cats. Soon, I’ll have 1. They’re going to kick me out of the crazy cat lady union. And yes, December is busy and demanding and tough–I’m praying not to have to deal with this loss in the midst of all that. 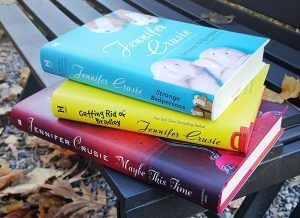 This is the time when I often a Jenny Crusie reread spree because I don’t have the brains to read something new. These books are going to be very timely. I’m with you, Deborah. My pets are my writing muses, too. Big hugs. I totally understand. I’m still missing my baby who passed last year. Whenever it happens, it won’t be easy. I hope it doesn’t happen any time soon! Perfect, I don’t have the hardcovers for 2 out of 3. Merry Christmas to me. I told my husband, and he asked if I already had those. Then he remembered all the duplicate Beatles records he has, and he understands. I’ve got a good one. Happy to be exploited under these circumstances. Last year my husband ordered so many from Mollie that she included a funny note on one of the packing slips which we saved. It was when I was feeling miserable from radiation and the election. The orders then meant that I was all set for a massive reread when we learned in January that my cancer was not gone, but had rather progressed a few stages and I desperately needed distraction and comfort books. It meant then that when I was offered Marinol by a doctor because the new drugs were so awful regarding nausea and pain (Marinol is a synthetic substitute for the active component of pot) that my husband made a joke about Grady from Charlie All Night and we talked about how you’re a freaking warrior for talking about that important issue when you did since we’re still having to fight arseholes who think that pot for cancer patients will somehow make the opiod crisis worse (when the doctors I’ve talked with think it would make it much better, but that’s a rant for another day). Anyway, thank you for all you write. I owe so much to you. I know how devastating chemo can be and how much pot can help from personal experience: it meant I wasn’t nauseated at all instead of throwing up for five days straight. I’ve been in remission for thirty-five years now, so it can happen. I’m praying it will happen for you. Good luck! I hadn’t realized it was from your own chemo hell. Thank you for sharing. You must have been younger than I was when I first was diagnosed, and 30 seemed shocking to me! Half-selfishly, I am incredibly grateful that your treatments succeeded. Not at all by halves, knowing that you’ve been in remission so long is inspiring. Thank you for the luck and prayers. I very much rely on those as I hope to defy the odds. The one good thing about it is that you never take a minute for granted again. I’m still amazed that I’ve lived to see my grandchildren. At one point, the statistics gave me six months to live, and I was a single mother, trying to figure out how to deal with Mollie. I seriously think that my determination that nobody was going to raise my kid but me helped, but so did surgery and chemo and great doctors. I was very lucky. Keep us posted, please. We want to keep sending good vibes your way.